I know Fleming isn’t producing these anymore, but is anybody able to reproduce this stock? I’ve seen them from time to time, and now the price seems to be going higher and higher. At some point I figured they would be produced by another party. Anyone have any info on a manufacturer that might produce this in the future? I have the stock adapter for the A2/MP5.....if that's what ya mean. Glad to hear the price is going up on these. Not my photos. Sources from the interwebs. That looks uncomfortable. But also cool to see a variant of the K stock that I've never seen before. 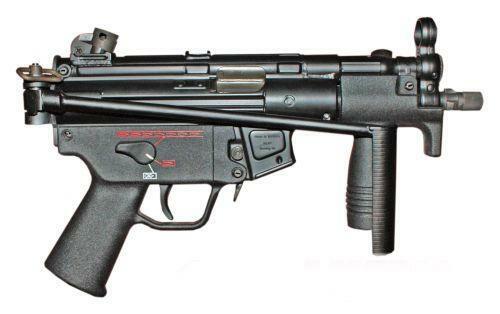 A good friend has one on his MP5K sear gun. I’ve shot it with both the Fleming stock and the Choate stock. The low felt recoil from this gun really makes it manageable. The MASSIVE benefit is the extremely small profile of this stock as compared to the Choate or the B&T. Hands down the B&T is my favorite on the full size MP5. The window cost more than the package/stock! Another cool folder, by RDTS.